Ranch and bacon are probably two of my most favorite things. Ever. I don’t usually combine the two, but hello- how could it not be magical?! When I’ve tried it, it’s never disappointed before. Cheddar bacon ranch quiche, pull apart bread, stuffed tomatoes, a creamy dip, even a pierogi bake. It’s a classic flavor combination that’s always delivered- especially when combined with a cheese of some kind. Right now though, I’m already planning my spring menu. The upcoming Easter season is especially on my mind. So I already know I’m gonna be overwhelmed with hard boiled eggs. I mean while we enjoy the traditional dying of the eggs, I also have four kids. Half of whom don’t live at home anymore, but still come home and enjoy our holiday traditions. That adds up, quickly. To a lot of hard boiled eggs. Deviled eggs are almost always my go to to use them all up. Even we reach a point though where we pass on them. Hard to believe, I know. So what’s a clever Mom to do? Get creative of course! 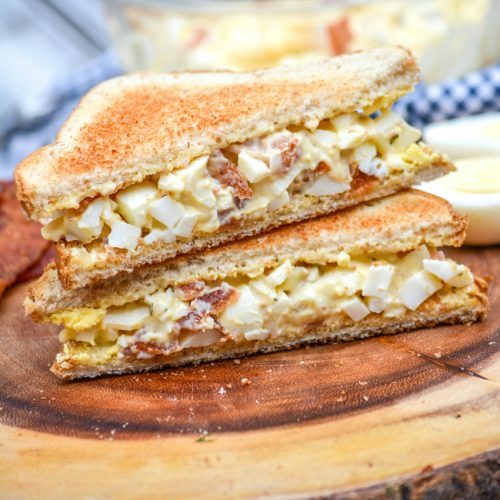 Egg salad is obviously a close second in the realm of using up all those boiled eggs. Just like I mentioned earlier though, I can’t always get excited about the same old, same old. I can’t even enjoy it after a certain point. A change was in store, and much needed. Hallelujah. Hands up in the air! 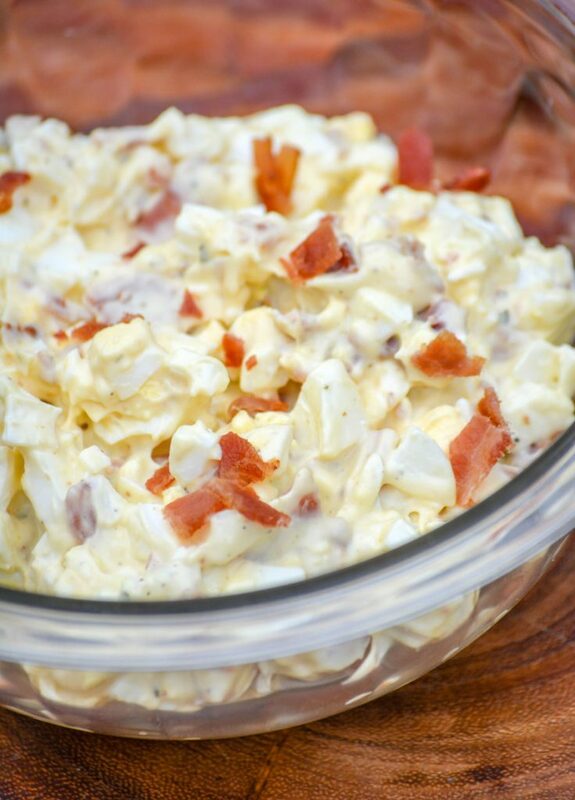 This Bacon Ranch Egg Salad fixed all of my problems. It used up several of the eggs I had on hand, and it tasted amazing. Bonus points, because it included one of my fav flavor combos. 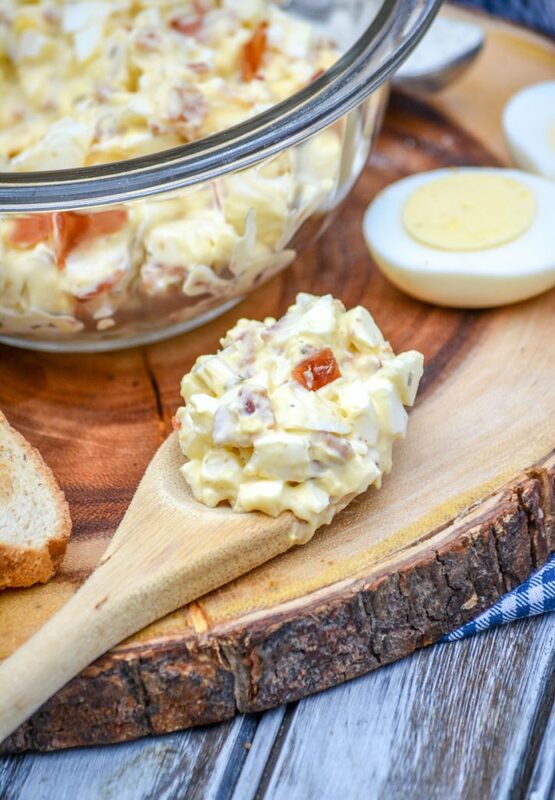 This egg salad is super simple to whip up, and only requires a few ingredients. So simple, and using mostly ingredients I keep on hand, that it’s one of my go-to’s if unexpected company drops by or we need a last minute lunch. It gets rave reviews, which is always a plus- especially since it requires hardly any effort. 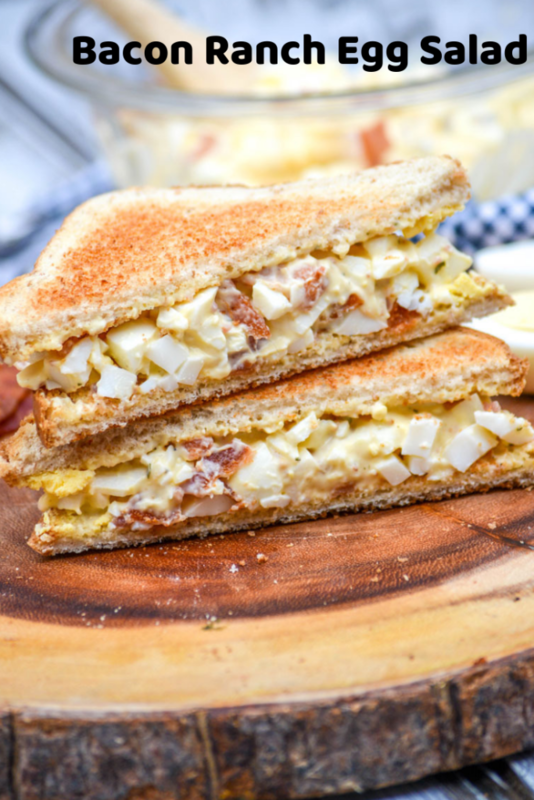 You’ll need 6 hard boiled, peeled eggs & 6 strips of bacon, cooked crisp and drained of any excess grease. Roughly chop your hard boiled eggs. I like to chop mine small, giving the egg salad a more uniform texture but there’s nothing wrong with wanting a rougher, larger chop. Crumble the bacon and add them both to a medium sized mixing bowl. Add 1/2 cup of of mayonnaise and 1 tablespoon of ranch dressing seasoning mix to the bowl. Use a spatula to stir everything together until evenly incorporated. Voila- the bacon ranch egg salad is done. You can serve it right away as is, or chill it and serve cold. We’ve served it as an appetizer almost like a dip with crackers. Also, obviously, on sandwiches. Toasted or un-toasted works, but toasted will always be my favorite! 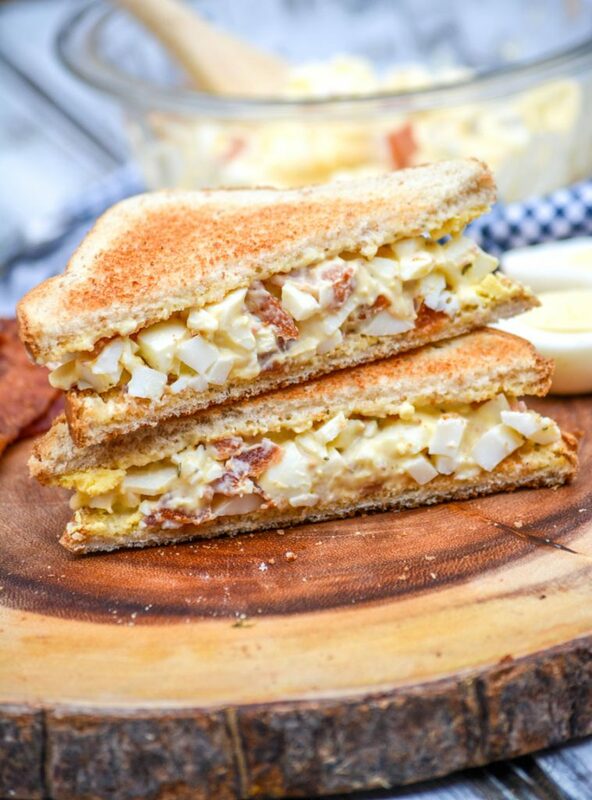 A creamy egg salad, this one was made to beat all others. Mixed with crisp crumbled bacon, creamy mayonnaise, and infused savory ranch dressing seasoning- it’s so yummy! Guests will never guess how easy it is. 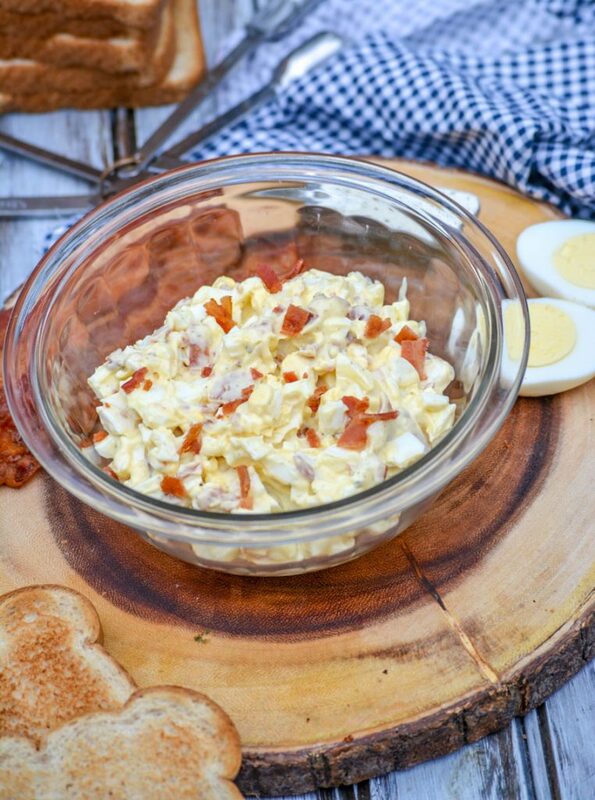 Rich & creamy, your traditional egg salad is upgraded with the addition of crisp bits of bacon and ranch dressing. Roughly chop the eggs, and transfer them to a medium sized mixing bowl. Add the bacon to the bowl, tossing to evenly incorporate. Add the mayo & ranch seasoning to the bowl, stirring until the mixture's evenly incorporated. Cover the egg salad, and refrigerate until chilled through. Serve on your favorite pieces of toast or bread, with crackers, or even with celery. Another yummy delight from your kitchen to ours! Thanks so much! I made this recipe recently for my family and it was a huge hit! The ranch offers subtle flavors and the bacon truly makes it next level! Everyone enjoyed having these sandwiches for school lunches last week. It’s a keeper. 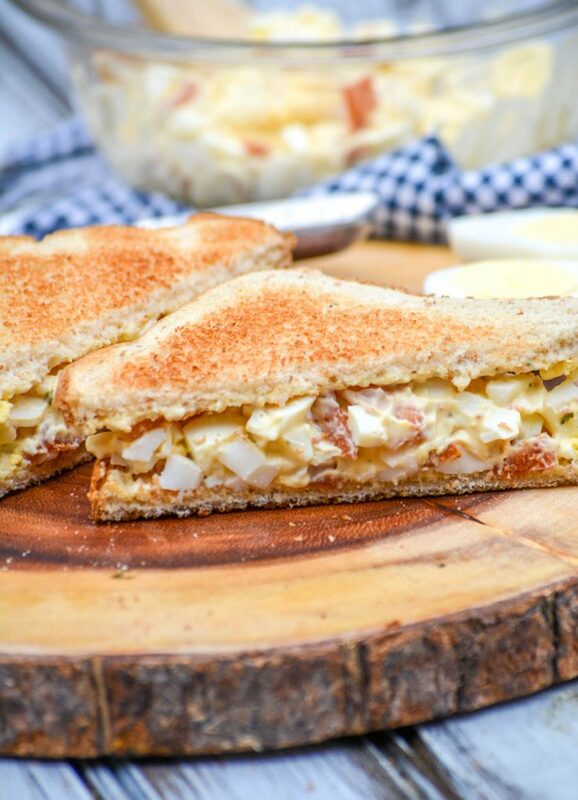 It’s my favorite way to enjoy egg salad now. With Easter coming up, I’m gonna have to make a big old batch of it with all those leftover hard boiled eggs!